There are marine mammal species living in all the oceans – tropical, temperate, and polar. 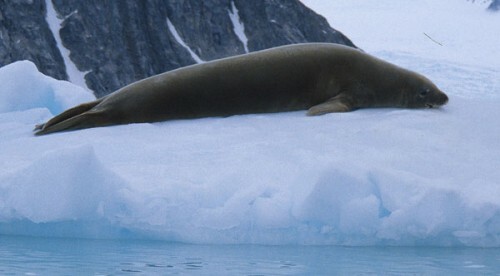 In Antarctica there are numerous seals and whales. 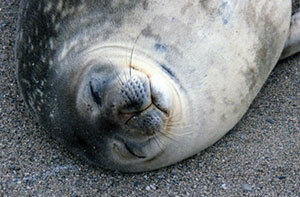 Seals are classified with the pinniped group (seals, sea lions, walrus). Whales are classified with the cetacean group (dolphins, porpoises, toothed whales and baleen whales). Antarctic pinnipeds are some of the most unique on Earth, ranging from the filter feeding crabeater seal to the carnivorous leopard seal. Each pinniped species in the Antarctic has a very different ecological niche so that there is rarely any competition and they coexist peacefully in Antarctica. Leopard seal resting on an iceberg. One of the top predators in the Antarctic is the leopard seal. Its scientific name is Hydrurga leptonix. They get their common name (leapard) from the spots on their fur that resemble a leopard. They feed only in the water although they have been known to rock an iceberg to tip off a young seal or a penguin. They must ambush their prey as they are not fast swimmers and often hide under icebergs in wait for a lone penguin to swim by. In order to get enough to eat they need about six penguins per day. They rarely are able to catch six penguins per day and most leopard seals supplement their diet with krill. The krill may make up to 50 percent of their diet. Some of their teeth are similar to the fancy teeth of the crabeater seal for filtering krill out of the water. They may become aggressive to humans in small boats so should be treated with caution. Crabeater seal with a perfect pelt (unusual). 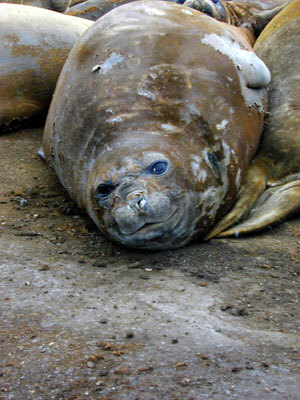 Crabeater seals (Lobodon carcinophagus) are the most numerous seal species on Earth. Their name is a misnomer as they do not feed on crabs – instead they feed on krill. They have very complicated teeth for straining the krill from the ocean water in a similar way to the filter feeding whales. Crabeaters take in a large mouthful of water (laden with krill), push the water through their fancy teeth, and the krill is left in their mouths. They often take in up to 20 kilos of krill per day during the Antarctic summer. 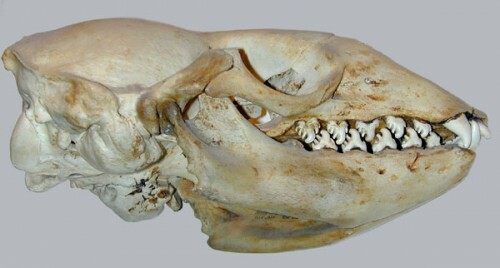 Crabeater seal skull showing 'fancy' teeth for filter feeding its krill prey. This species has a different reproductive behavior than most seals. The males find a receptive female, mate, and the couple stays together as a family unit while raising the pup. Most seals reproduce in large groups rather than as single pairs. After raising the pup the seals separate and are generally solitary the rest of the year. During their first year of life most crabeater seals have an encounter with the carnivorous leopard seal, receiving sets of parallel distinct scars (from the sharp incisors of the leopard seal) on their sides. Almost 80 percent of adult Crabeaters have these scars. As adults, the crabeaters are usually not bothered by the leopard seals but the scars of their youth made their pelt unattractive to sealers. This species of seal was rarely taken by early sealers because of their damaged fur. The large population numbers of this species may be because their population was not decimated by the sealers and the fact that their food (krill) has increased. They are always along the edge of the pack ice and rarely venture inland (too far from their food). 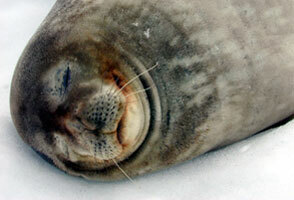 Crabeater seal with scars from a leopard seal. Weddell seal resting on shore. The southernmost ranging mammal on Earth, the Weddell seal (Leptonychotes weddelli) can be found in Antarctica to 80 degrees south. They feed on ice fish and antarctic cod, often at depths of 100 to 700 meters. This species maintains a breathing hole in the ice (far from the shoreline) by actually biting the ice – their incisors are especially adapted for this by pointing forward. They not only maintain an opening in the ice to breathe but also to come and go from the surface of the ice. If the ice is thick they will hollow out a dish shaped path from the top of the ice down to the open hole so that it is easy for their fat bodies to slide down the path or to haul themselves up from the water. 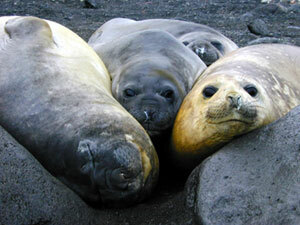 The Weddell seals breed in October, babies are born a year later. (Although they have a shorter gestation period, many pinnipeds have delayed implantation, which delays the development of the embryo so that it will be born the next year at the beginning of summer.) The infant Weddell seals have the longest nursing period of any seal – a full seven weeks. Weddell seal with wet, straight whiskers. Weddell seal with dry, curly whiskers. Their cat-like face, large bodies (up to 1,000 pounds), spotty undersides, and whiskers that curl up at the tips when dry easily distinguish this species from other Antarctic seals. Most Weddell seals have a short life (only about 12 years, compared to 20-40 years for many other seals) because their teeth get worn down from biting the ice and without these they can not maintain a proper breathing/feeding hole in the ice. Their habit of being far from open ocean removes them from their major predator (the killer whale) but the majority of Weddell seals die of starvation when their teeth get worn. When at sea the southern elephant seal (Mirounga leonina) spends over 80 percent of the time submerged in the ocean – either on a shallow dive or on a deep dive. This species feeds on squid and fish – often in deep water. This is the deepest diving seal (up to 1,620 meters) and is only rivaled by the Sperm Whale for the record of the deepest diving mammal. Elephant seals are well adapted to deep diving, having large eyes to see in the depths, the ability to carry large amounts of oxygen in their bodies and the ability to control their circulation. Their ability to carry more oxygen than shallow diving seals is because of having more hemoglobin (oxygen carrying molecules) in their blood, more blood volume (stored in a sac-like structure outside their heart), and having large amounts of myoglobin (oxygen holding molecule in muscles) – up to five times that found in other mammals. The control of circulation to aid deep diving is their ability to shut down peripheral circulation and digestive circulation (conserving oxygen) and their ability to slow their heart rate (bradycardia) but these are done only during deep dives. The southern elephant seal is the largest seal in the world – the males reaching five tons. Their breeding is highly structured and only 8 percent of the males get to breed each year. The elephant seals breed on land, returning to the same beaches where they were born. The males return first each year in late spring and early summer, fighting for territories on the beach. They inflate their large noses, bellow into them, stand tall and lunge at each other hitting with their calloused chests. The loser slinks away, moving out of the “beachmaster’s” territory. Females come ashore after the territories are established and sort themselves out into “harems”, the strongest bulls (beachmasters) have the largest harems and the weakest bulls have small harems – about 92 percent of the bulls have no harems and are pushed to the edge of the rookery. The pregnant females give birth on land in this structured situation, nursing their single pup for about three weeks. Then, they become sexually receptive and this is the time the bull will mate with the females in his harem. Males cannot feed at all during this entire time as they cannot leave their territory (or it will be claimed by another bull) and may lose up to 1/5 of their body weight. The females leave the rookery after nursing their pups, going to sea to feed. The exhausted males also leave and the babies (“weaners”) are left on shore until they get hungry and leave. They shed both their fur and skin in large patches. During this time they increase the circulation to their skin surface to aid in the molting process. This makes them more sensitive to the cold (losing heat through the increased surface circulation) and they rarely enter the cold ocean water during this period. They can be seen itching their patches of molting fur and lying along the Antarctic beaches near penguin rookeries. 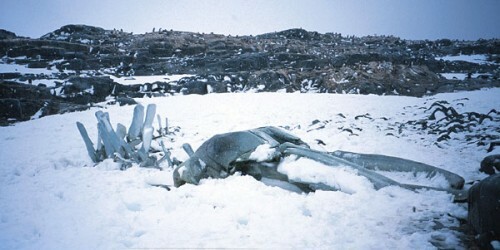 Baleen whale skeleton left by whalers. Travelling all the way from tropical breeding grounds, many baleen whales return each summer to Antarctica to feed on the bloom of krill. Baleen whales (or the mysticeti) have no teeth, instead they have numerous plates of baleen growing from their entire upper jaw. These plates of baleen are made of fingernail-like material and are frayed on the inside. The fraying forms a broom-like surface on the inside. The mysticete whales (like Minke, Humpback, and Blue) take in large mouthfuls of water and squeeze it through this baleen, thus the krill and other critters in the water are stuck on the inside of the baleen and can be licked off by the tongue. Toothed whales (or the odontoceti) have conical teeth in their mouths – some with teeth on both jaws and some with teeth only on one jaw. The toothed whales are all carnivores and include the dolphins, porpoises, Sperm Whale, and the Killer Whale. Minke whale at rest at the surface, note the abnormal notch in its dorsal fin (an individual identification mark). One of the most numerous baleen whales in the world is the rather small baleen whale called the Minke whale (Balaenoptera acutorostrata). Sometimes this whale is referred to as the “stinky Minke” because of the smell of its breath. The Minkes feed on krill and small fish. This species has light colored baleen (some baleen whales, like the Humpbacks and Blues, have black baleen) and throat pleats (to accommodate more water in their mouth for filter feeding). Back and dorsal fin of a diving Minke whale. Minkes in Antarctica are currently hunted by Japan (much to the dismay of most of the countries of the world who abide by the International Whaling Commission, or IWC, standards that prohibit commercial whaling). Other countries that still whale (like Norway) do not belong to the IWC but Japan is a member of the IWC and insists its whaling is for scientific purposes even though only a handful of respected scientific papers have been published by Japanese researchers in the last dozen years. Most of the world’s whales are now at only 1-5 percent of their original population levels (due to whaling) but it is agreed that the Minke’s population numbers are greater now than they have ever been and their numbers have been increasing since the 1970s. The Minke whale was not historically taken as were the right whales, blue whales, fin whales, humpback whales, sei whales and sperm whales because they were too small and too fast. Without the competition for food with the larger baleen whales (now at extremely low levels), the Minke population may be increasing simply because they have more to eat (like the penguins and crabeater seals). Perhaps the most entertaining whale is the humpback whale (Megaptera novaeangliae). This whale is well known for breaching (jumping almost completely out of the water and splashing down), fluking (flipping its tail out of the water before diving) and singing (repeating a series of sounds unique to its population that changes season by season). Each individual humpback has a uniquely colored and shaped fluke (tail) so that individuals can be told apart simply by a photograph of the underside of the fluke. Most individuals belong to either a northern hemisphere or a southern hemisphere population and rarely cross the equator. The humpback regularly migrates between summer tropical breeding grounds and winter polar feeding grounds. Their return to the tropics each winter may be more for the protection of their young from killer whales than for the warm, calm tropical waters away from the polar storms of winter. 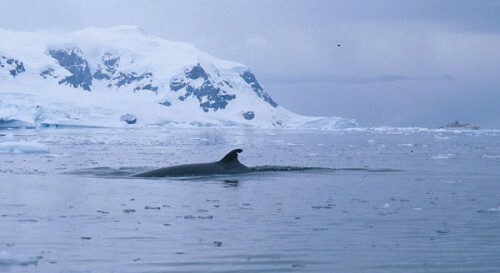 Southern hemisphere humpbacks can be found in Antarctica during November, December, and January (the southern hemisphere summer) when the northern populations are wintering near the equator. During the southern hemisphere winter (June, July and August) the southern populations leave Antarctica (as the krill bloom declines) and head north toward the equator at the same time that the northern populations are heading to Arctic waters. Not every member of the population migrates however. 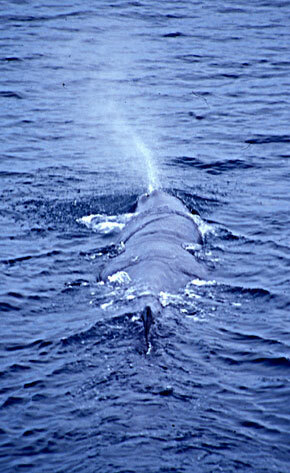 Blue whale back and dorsal fin. 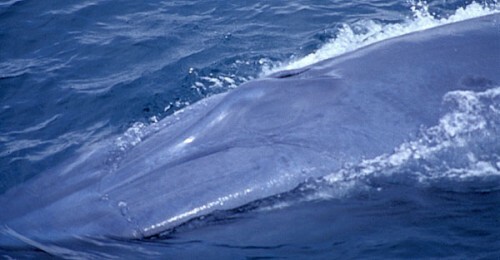 Blue whales, Balaenoptera musculus, have the distinction of being the largest animal on earth. 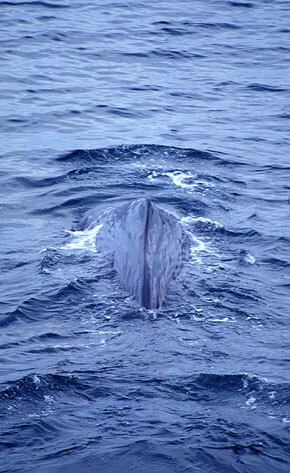 The Antarctic blue whales were heavily fished and their numbers have declined. In the ‘old days’ it was not uncommon to see a blue whale over 100 feet long but this is a rare event today. 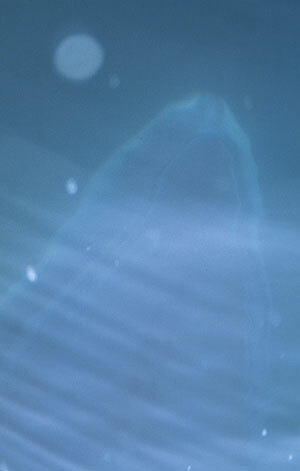 The blue whales that come to Antarctica during the summer plankton bloom are primarily a southern hemisphere group. Even in winter, when these animals migrate north, they would rarely cross the equator. There is a separate, rather large, population of blue whales along the west coast of Mexico, the United States, and Canada. It appears that the population numbers of this northern hemisphere group are increasing. Called the orca, or killer whale, Orcinas orca is one of the largest top predators in Antarctica. This whale feeds on all of the pinnipeds (seals and sea lions), seabirds and any whales they can catch. They have teeth lining both jaws and often hunt in groups on prey larger than themselves. They have been known to beach themselves to get an unsuspecting seal or sea lion off the beach. Sperm whales have teeth but only on the lower jaw. They are carnivores, feeding on fish and squid. The sperm whale is one of the deepest divers of all the marine mammals. It is believed it dives to find giant squid that live at great depths. The oil from the head of the sperm shale (called spermaceti) was prized as a fine machine oil – making the sperm whale a main target of the whaling industry for centuries. Sperm whales are not as prominent a member of the Antarctic community as the baleen whales (Minkes, humpback, and blues) or the killer whales but they still have an influence.